I don’t get around much… I hike the same old woods over and over… and over. Still, I manage to find something new to learn about all the time. 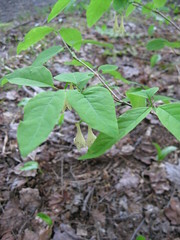 And, as I’m trying to walk briskly, there on the side of the trail is a tiny shrub with dangling trumpet-like flowers. What? Not Wild Oats. Not Solomon’s Seal. Not Trout Lily. 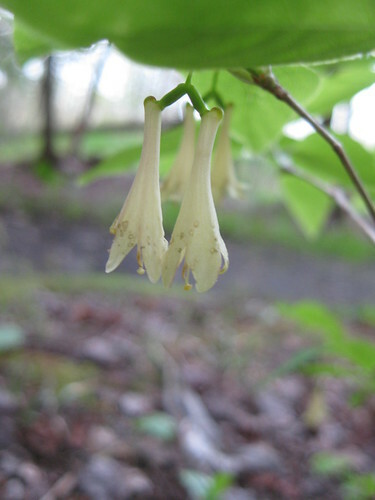 A creamy, white dangling trumpet-shaped flower on a small shrub with woody stems. WHAT? 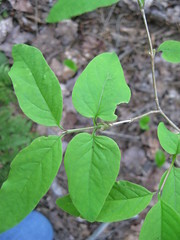 American Fly Honeysuckle (Lonicera canadensis) is a shrub of cool woodlands. It is recommended by the Lady Bird Johnson Wildflower Center as a native alternative to planting the alien invasive honeysuckles Lonicera maackii (Amur honeysuckle), Lonicera morrowii (Morrow’s honeysuckle), Lonicera tatarica (Tatarian honeysuckle), and Lonicera xylosteum (Dwarf honeysuckle). I visit many of the same patches of woods over and over too.-There’s always soemthing nw to see if you look close enough. Thanks so much for sharing all your excellent pics of such gorgeous, delicate, exquisite flowers. And to think they just bloom for such a short time! I’m so glad you’ve captured their beauty! Will you stop by to visit? From reading your wonderful blog, I believe we share sensibilities. We agree with the other commenters’ sentiments — there is something truly magical about walking the same paths and noticing that no two walks ever present the same sights, smells, and sounds. Sometimes it’s only subtle changes, but noticing those changes hones our senses so that we’re better able to appreciate everything nature has to offer. Thanks as well for introducing us to a new species — it truly is interesting how the common non-native species are so familiar to most of us, but the natives (who are often more elusive) aren’t. You always are discovering and learning something new. I seem to observe…sometimes I google and learn..sometimes I just look.. But I admire that you take the time and effort to find out about the things you are seeing around you. I mention your blog in my latest post. I am always amazed at finding different landmarks at different times of the year. For instance, you would think that things like a 100 year old cement property boundary pillar would be more visible in the winter, when the leaves are off the trees. But, one summer day on the Sandy Creek Trail, I spotted the marker down through some trees. It was like finding a pot of gold to me !! I love finding man made artifacts from days gone by. Things like old foundations, wooden brine water collection tanks and railroad relics fascinate me to no end. One of the cooler landmarks around here is what those of us who know about it call ‘the stone bowl’. It is a giant ‘wishing well’ about 25 feet in diameter and about 15 feet deep. It is made entirely from field cut stone and it’s purpose was to hold water to replenish the boilers on the old steam locomotives that ran the rail line down over the hill from it. It was fed with an elaborate system of pipes and valves. I have lots of that japanese honeysuckle–too numerous to eradicate. Thanks for spotting this native–never seen it before. It’s always a treat to discover a new species on a familiar patch! 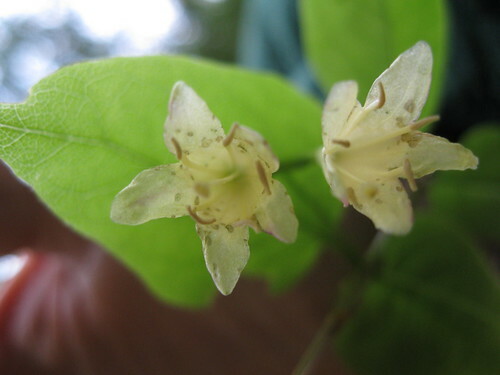 Did this native honeysuckle smell? so glad you went and posted your pictures, when I was working there with my class I kept seeing flowers and wishing you were there to tell me what they were!! And now you have!! Genius!